The sneaker store and website/blog from Barcelona, Sivasdescalzo.com invited me to do a quick interview for their sneaker bloggers series. Check the interview out here. Also, please don't mind the photo of myself above, a little embarrassing since I'm more used to being behind the camera. haha! Favourite pair of sneakers of all time? What do your sneakers say about you? Tell us something about yourself that could surprise people. A big thank you to Vanessa of Sivasdescalzo. Hope to work with you guys again soon! 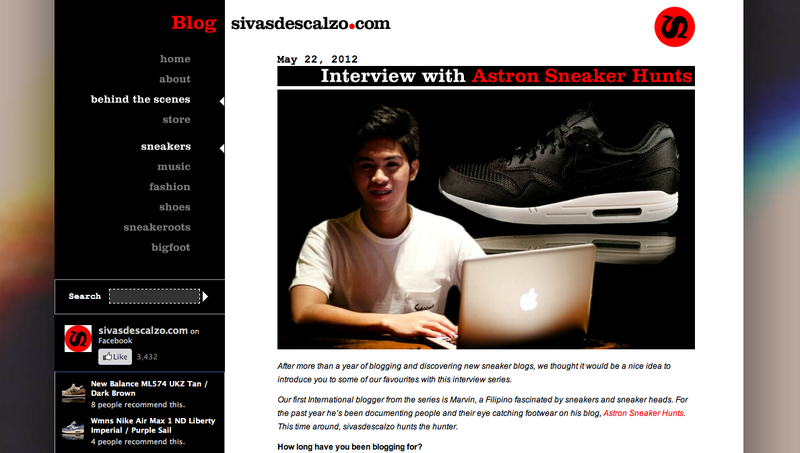 I guess it's a honor to be interviewed by an international online sneaker store. This would really help the Philippines to get noticed by fellow sneaker heads in the foreign sneaker industry. Kudos, Marvin! More power to your blog. It's really an honor Kyle. I really hope this would help our local community flourish. Thanks man!